You may have seen individuals or groups at the park moving in a slow, synchronized routine. They look so peaceful as they concentrate on a point in the distance. Their arms almost seem to float in space. They are practicing the ancient martial art of tai chi. The practice is typified by very slow, deliberate, repetitive, and low-impact movements—making this an ideal workout for seniors and those with limited mobility. Tai chi is based on relaxation and coordination. The National Association of Orthopedic Nurses even endorsed tai chi for seniors seeking to strengthen their muscles and increase their flexibility through this gentle aerobic exercise. Dating back over 2,500 years from China, tai chi had become increasingly popular throughout the world. Tai chi is an ancient Chinese martial art that descends from qigong, a discipline that involves the mind, breath, and motion, to create a calm balance. Tai chi, described as meditation in motion, is believed to clear your mind and reduce your stress through focused concentration on the movements. How can it benefit older adults? There are many great benefits of tai chi for seniors. Research has found that seniors who regularly practice tai chi are steadier on their feet, less likely to suffer high blood pressure, and physically stronger. Tai chi has been known to improve hand/eye coordination, increase circulation, and can even promote a better night’s sleep. But perhaps the biggest benefit to many isn’t only physical—but emotional. Many seniors are unsteady on their feet and have an extreme fear of falling. Ironically, the biggest predictor of a fall is the fear of falling. This fear can be stressful and deter them from participating in activities. Tai chi can make them feel stronger and more stable—taking away that fear and adding to their personal sense of well-being. Can people living with dementia benefit from tai chi? Any type of movement that gets seniors off the couch and moving can be of a great benefit both physically and emotionally. 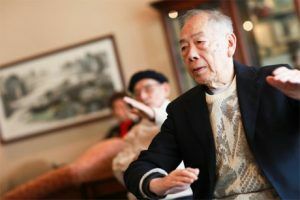 Movements may need to be adapted, and some moves can be made while seated but there is no reason not to encourage your loved one with dementia to try tai chi. And some studies suggest physical exercise can help to delay the advances of dementia. As with any change in physical activity, first discuss this with their physician. The best thing about tai chi is there is no special equipment. A skilled teacher can easily adapt movements to fit every age and fitness level. Taken as a class—either indoors or outdoors—is a great way for seniors to socialize with their peers. Contact a local senior center, Aegis Living community, or search for tai chi classes online to find a beginner’s class near you.